Raleigh, NC — In an interview this week with WGHP, Senator Burr laid out the clear difference between him and Deborah Ross when it comes to Obamacare. Senator Burr fiercely opposes Obamacare while Ross continues to embrace the law that’s driving up healthcare costs for North Carolina families. This contrast on Obamacare comes at a time when even former President Bill Clinton is acknowledging the failures of Obamacare, calling it a “crazy system.” Ross has supported Obamacare since it’s inception and when she had a chance to exempt North Carolina from the individual mandate while in the state legislature she voted against doing so. BOB BUCKLEY: There is a distinct difference in what the two U.S. Senate candidates want to do about the Affordable Care Act, what most people, including the president, now refer to simply as “Obamacare.” First, Democrat Deborah Ross says that although some medicine is required Obamacare is a patient that can be saved. DEBORAH ROSS: The ACA is not perfect but it is better than what we had. There are a lot of different ways to do it. Giving consumers more options. Right now the main option is just the private insurance pool. We should allow non profits and co-ops to compete. We should allow the government to compete if it can. We should also eliminate the medical device tax and we shouldn’t tax businesses that provide outstanding healthcare to their employees. BOB BUCKLEY: Ross is talking about the tax on what is called “Cadillac plans,” the generous plans that, for example, unions often negotiate for their members. That tax and the tax on the sale of medical devices she mentioned was a big part of the revenue though, to pay for the ACA and what Sen Richard Burr points out is 16 of the 23 state healthcare exchanges set up by Obamacare have gone bankrupt because the law requires so much to be covered and the payments can’t keep up with the cost which is why Senator Burr proposes a new system. SEN. RICHARD BURR: Well I think anything short of repeal of the Affordable Care Act does mean that it implodes and that we go to a single payer government run system where the government has full control over who we see when we see them and how much that person is reimbursed. North Carolinians regardless of where they are have seen over a 60% increase in their premiums this years projection is somewhere between 18 and 25 and for 94% of North Carolina we’re down to one insurance carrier in the pool. It has done anything but made it affordable or provided us the ability to keep our doctor if we liked our doctor. BOB BUCKLEY: The Obama Administration says that the law is a success because it has helped between 10 and 20 million Americans get coverage when they didn’t have it before. Just last week, Senator Burr penned an op-ed in the North State Journal that highlighted how Obamacare is imploding before our eyes. In the op-ed, Senator Burr details how his proposed Patient CARE Act would give Americans more choice and freedom to make decisions that best fit their healthcare needs. “Obamacare is imploding. With each passing day, we see more evidence that the program that promised Americans affordable health care is on the verge of total collapse. “The failures of Obamacare are well documented in the media. Insurance premiums are skyrocketing for both families and employers, insurers are withdrawing from the exchanges, and consumers are seeing their health care options rapidly disappear. Under Obamacare, families are paying much more and getting way less. “Based on the proposed rate increases submitted to the North Carolina Department of Insurance for approval, North Carolinians could experience an increase of 19 to 25 percent in the cost of their health insurance coverage for 2017. It remains to be seen how much more premiums will skyrocket once the final rates are announced this fall. “To make matters worse, the Kaiser Family Foundation predicts that for next year, 90 percent of North Carolina counties will have only one choice of insurer. 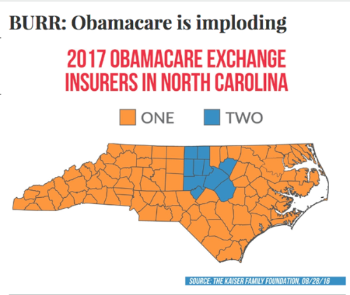 Enrollment for an Obamacare policy for 2017 begins on Nov. 1, and when North Carolinians log on to the Obamacare exchange this fall to shop for a plan, they will likely find only one choice of insurer and a steep price tag. “No matter the political affiliation of our next president, he or she will have to work with Congress to address this collapse. I have offered a solution called the Patient CARE Act that would take steps to make quality, affordable health care accessible to every American through commonsense, patient-focused reforms. I believe this plan could serve as a basis for working together to roll back Obamacare’s bureaucracy and red tape and give Americans greater freedom and more choices to select the plan that best fits their pocketbooks and health needs.